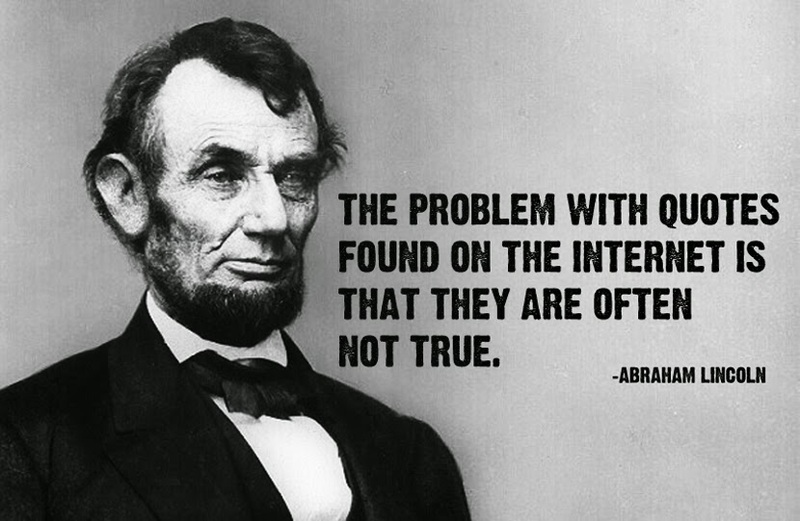 When using the internet to research information I think it is important to keep Abraham Lincoln in mind…. That being said, the internet is a valuable resource for learning and discovery. The key is to verify your information by checking the facts among multiple sources. What 3 facts did you learn from your other sources? What have you learned about the tree octopus? What have you learned about the internet? What have you learned about the information you can find on the internet? What has Abraham Lincoln taught you about the internet? Please post your comments with all the above information, and answers to the questions, in full and complete sentences. 1Tree octopuses can steal an egg from the tree. the tree octopus has the largest brain to body ratio for any mollusk. The tree octopus is an octopus that can live in trees. 2 Tree octopuses do not Exist. We should not believe with the Internet says sometimes. Never think that something is something if it's on the Internet. 4 You cannot always believe it. 5 You should never have just one source. 6 That the Internet is not the first source you should use. The tree Octopus are not real,They also live in the rainforest ,they are able to keep from becoming desiccated for prolonged periods of time, but given the chance they would prefer resting in pooled water. Abraham taught me not to believe everything you read on the internet because its not all true . 1. The Pacific Northwest Tree ocotpus can be found in the temeperate rainforest of the Olympic peninsula in the West Coast of North America. 2. The Pacific Northwest Tree octopus is amphibious. 3. They show their emotions by changing the color of their skin. 1. They use their 8 arms to swing from branch to branch and to grab small prey such as insects and frogs. 2. During their mating season they return to the water but after they resume their life in the forest. 3. IT is 33cm in length and 6ft in diameter. !. I learned that they show emotion by changing the color of their skin. 2. I learned that I can find a lot of information using the internet. 3. I learned that the information may not always be true. 4. 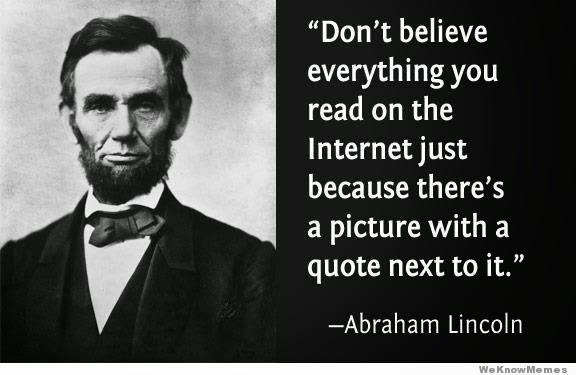 The quote next to Abraham Lincoln taught me that the information on the internet might not always be true. 1. The Pacific Northwest Tree Octopus' average size is 30-33cm. It can live on land and water, they are amphibious. The Tree Octopus' prey are insects, rodents and frogs. 2. One of its predators are the Sasquatch. Its Latin name is Octopus Paxarbolis. The Tree Octopus is a hoax created by Lyle Zapato. 3. I learned that the Tree Octopus is a very interesting creature, but is doesn't exist. 4. What I learned about the internet is that it can't always be trusted. 5. I learned that the information on the internet doesn't always truthful. 6. Abraham Lincoln has taught me that the internet is not reliable, there are a lot of hoaxes and lies. Three facts about the tree octopus are that there tentacles reach up to 30-33 average, the tree octopus lives with touch and sight, and tree octopus are getting extinct because of habitat problems. Two other resources are snopes.com and hoaxes.com three facts from those resources are the tree octopus uses their eight arms to swing from branch to branch, the tree octopus is not on the endangered animal list but it should be, and tree octopus live on the olympic national rain forest in washington state. I learned how tree octopus live, why they are endangered, and facts about the tree octopus. I learned that the internet has a lot of information but not everything you see is real. I learned that the internet has a lot of false information. Abraham lincoln taught me that just because there is a picture with words it doesn't mean everything is true. The facts that I learned about the tree octopus is that they are endangered, they live in the west coast of North America, and they can change their color based on they emotions. I also learned that not everything can be true and appropriate when you search the web. Abraham Lincoln taught me that when you are using the internet that you shouldn't decide to read an article just because it looks pretty, since Anybody can put something on the internet even if it's not true. The tree octopus can be found in temperate rain forests. It has the largest brain-to-body ratio for any mollusk and it eats insects, birds. Tree octopuses are amphibious. Using two different sources (Wikipedia & snopes.com), I found out that the tree octopus is all but an internet hoax and a legend. The "tree octopus" is an endangered species. Although it is not on the endangered species list. The "tree octopus" is a hoax made by Lyle Zapato. The tree octopus is actually FAKE. I learned that we should not always trust the internet because the information we can find on the internet may be a hoax and be false. I learned this from Abraham Lincoln: "Don't believe everything you see on the internet just because there's a picture with a quote next to it." This octopus can live in temperate rainforests of the olympic peninsula, arm-tip to mantle-tip is 30- 33 cm, and they are endangered. Octopus paxarbolis means, Pacific tree octopus in dog Latin. Major prededor is the sasquatch. It is not on the endangered spiecies list. The internet is usefull. It is hard to find good information. Lincoln taught me a quote on the internet doesn't mean it is true. Three things that I learned from reading the Pacific Northwest Tree Octopus is that it's a very endangered species, however, it is NOT listed on the Endangered Species List, that it can live on both land and water (as seen in the article), and that they mainly live in the rain forests of Washington, namely the Olympic Rainforests. From two Google Sources (Wikipedia & Snopes.com), I found out even more facts. FIrst of all, this was all just a hoax. It was created in 1998 by a man by the name of Lyle Zapato. What I have learned about the tree octopus (Octopus paxarbolis) is that it is one of the most endangered species and it has taught me that you should always check sources before you read them. What Abraham Lincoln has taught me about the internet is that you always don't have to believe what you see, because the information on that website might be false information. #1 first fact: the North American tree octopus clogs up sawmills. Second fact: the North american tree octopus's ink stain the wood in sawmills. Third fact: the North American tree Octopus lives in the temperate rain forests of the Olympic peninsula. #2 sources: http://www.snopes.com/photos/animals/treeoctopus.asp, and http://en.wikipedia.org/wiki/Pacific_Northwest_tree_octopus. first fact: the North American Tree Octopus is a hoax, meaning that it's fake. Second fact: Students are fooled by the hoax. Third fact: The Pacific Northwest Tree Octopus created in 1998 by Lyle Zapato. #3 I have learned that the North American tree Octopus is a hoax. #5 I have learned that at least half of information on the internet is fake. 2 I have learned that the tree octopus actually lives on trees and that it is endangered. 3 The internet says many things and some people say things are true but it might not be. 4 The internet says things and it is your choice to believe or not. What I learned from the article:The octopus lives in a forest called a temperate forest. This animal changes color by mood. Every spring the Tree Octopus leaves the Olympic National Forest. What I found out on the Internet: The Tree Octopus is scarce and rare. This animal eats frogs and many types of insects. Some visitors think that the Tree Octopus spawns under water. What I have learned about the Tree Octopus: The Tree Octopus, to me, is a very shy and mysterious animal because it's scarce so scientists haven't got that much information on this animal. What I have learned about the Internet: The internet is like a whole other universe but really it's all made by us. What I have leaned about the information on the internet: The internet has a lot of information for us to find out. What Abraham has taught me about the internet: Abraham is right and wrong. The reason why he is right is because when you type something you want to see or read it isn't always want you want and sometimes it isn't real. He is wrong because there is always something we can find out on the internet. 2. The Tree Octopus changes color to express it's emotion. 3. The female octopuses can die when watching over their eggs. 4. (Bonus Answer) The information isn't real the website doesn't say that but I know its fake. 3. It was a project that was made to find out how gullible children are and if they believed everything they read on the internet. I have learned that the tree octopus is a project and a test, not a real creature. I have learned that not everything on the internet is true and you need to double check info before you use it. Three things I learned from the sights I found were that they were, given the latin name "octopus paxarbolis", its also a major predator in sasquatch, and it can live on land and water. What I learned about tree octopuses were that they are not real. You can't rely on every thing you see on the internet. I learned that on the internet everything is different so most things are not reliable so book are a better thing to rely on. Abraham lincoln taught me nothing cause there was no internet when he was alive.On his second quote it say that just because there name is on the quote and theres a picture of them next to it doesn't mean the quote is theres. Thats not his quote. The facts that I learned from the internet are. 1. The tree octopus is its made up. 2. I learned is that it was created in 1998 by Lyle Zapato. 3. The tree octopus is it was suppose to live in land and water. The facts I learned from the article are. 1.The tree octopus is endangered. 2. The tree octopus can be found in the temperate rainforests. 3. The tree octopus has great eyesight as good as a human. I've learned that the tree octopus is an internet hoax. I've also learned that there are some hoaxes on the internet and pretend things. This has helped me realize not to trust everything you read on the internet. Abraham Lincoln has taught me to check my sources. 1. The Pacific Northwest Tree Octopus can be found in the Olympic Peninsula on the West Coast of America. The Tree Octopus is able to keep from becoming desiccated for long periods of time. It has the largest brain to body ratio of any mollusk. 2. I learned about that the Tree Octopus lives in a tree. 3. I learned that it is a valuable resource. 4. I learned that everything you read on the internet is not necessarily true. 5. The picture of Abraham Lincoln with a quote about the internet on the internet shows you that everything you read on the internet is not necessarily true because there was no internet when he was alive. I have learned that it does not always say the truth. I think this because people write information in the internet that’s not true. Also can be two sources that say that the tree octopus can only live on land and the other source says it can live on land and sea. I choose the most trustworthy website. Abraham Lincoln has taught me that the internet is not always true. Some sources are some are not but people are smarter than the internet because the internet is something people write. 3.The tree octopus changes colors. For example RED means anger WHITE means fear and brown is just their natural color so they can blend in with nature. 3.some ar saying kids could be fooled. 4.i learned a lot i a lot of things about the tree octopus i never even knew an octopus could live without being in water which is really cool and they can blend in. 5.i learned a lot of things about the internet they all are so different and are all explained in many different ways. 6. the information is different then others because some say these websites might be fooling you and saying that some of the information could not be true. 7.I get it now because he says u shouldn't really believe in the internet so i get what i am doing now it all makes sense. 1. The Tree Octopus can be found in the temperate rainforest. 2. The habitat lies on the eastern side of the Olympic mountain range. 3. The Octopuses have eyesight comparable to humans. 1. The Tree Octopus Is only found in a certain part of the world. 2. Humans are smarter then the internet. 3. When you search something up it gives you options so you have to pick the right one. 4. Abraham Lincoln was not a live when the internet was invented so he really didn't know anything about the internet.